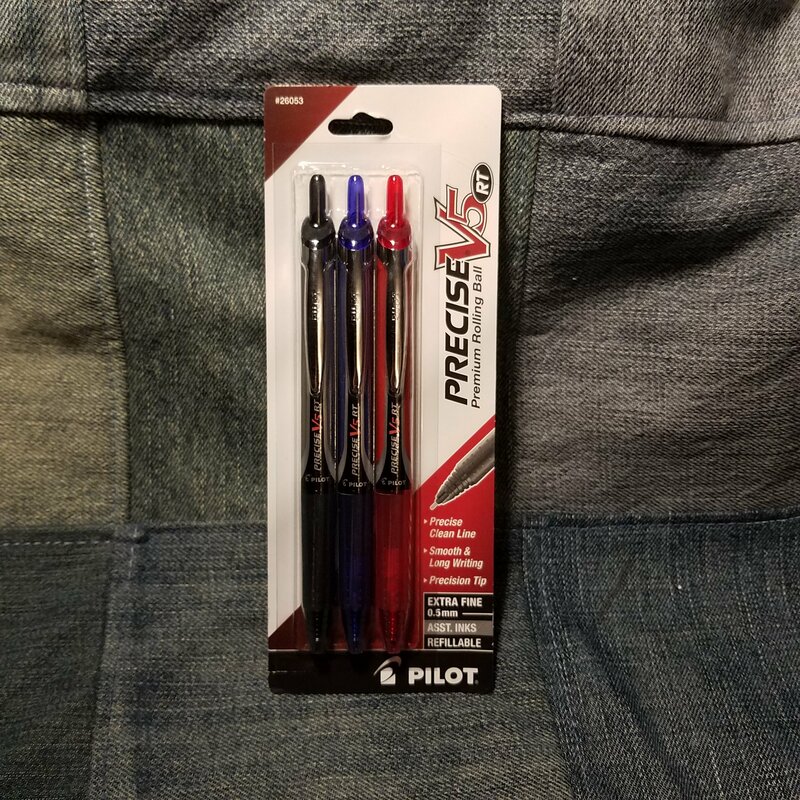 The Pilot Precise V5 has been around since the dawn of my stationery awakening and is a favorite of mine. I like it for just about every task- writing, notes, sketching and doodles. It is a great pen. Until I saw these on the shelf I’ve always bought the capped version. I don’t know if I simply wasn’t aware of the retractable version or if it wasn’t available. Regardless, I have them now and I’m never going back. 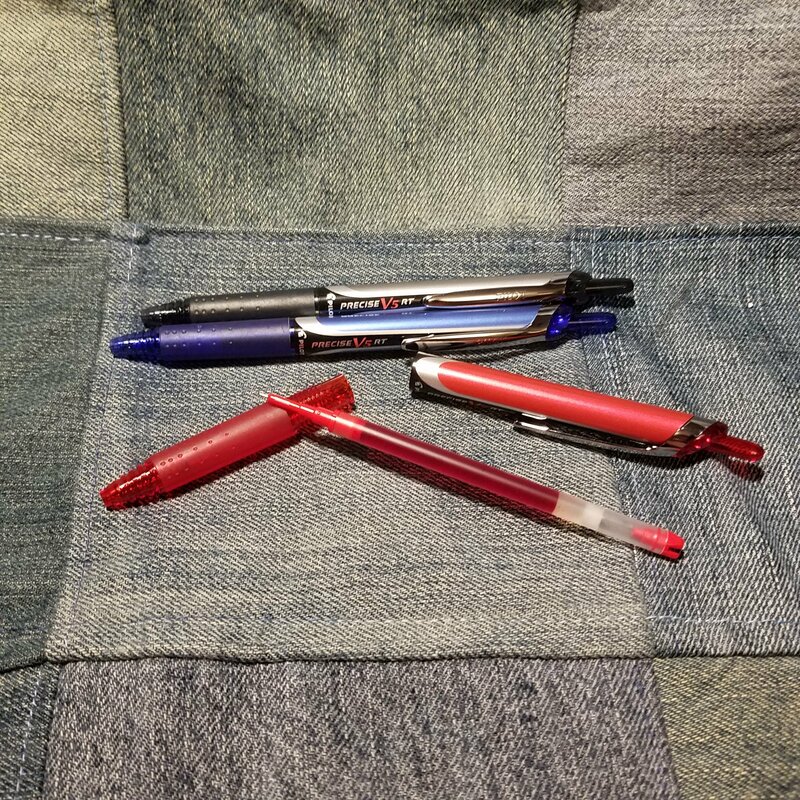 The design of the pen is simple and parts of it hearken back to the capped version- the grooves in the nose and swirly silver on the color, and translucent colored plastic. The similarities end there. The rubberized grip has DX-like divots. THe knock reminds me of the Signo 207. It has a long drive down to extend the tip and click into place. It does have a satisfying click noise. The clip is a futuristic wrap around that clips tightly to the placket of my shirt or a notebook. It wiggles from side to side and feels loose when it’s not clipped to anything. It’s not, it has a sloppy feel. Overall the Precise V5 RT is a great update to the capped version of the pen. You won’t lose a cap and the ink is fabulous. It does respond and feels more like gel ink than liquid ink. I’m okay with that. Anyway, you can get these on Amazon for around $2/pen. There are entire tubs of 48 of these pens- black and multi colors for around $55! They are also available in just about any store from Target to Walmart to Staples to the local grocery chain.